Want to impress your guests with a dessert that’s simple to make and will melt in your mouth? 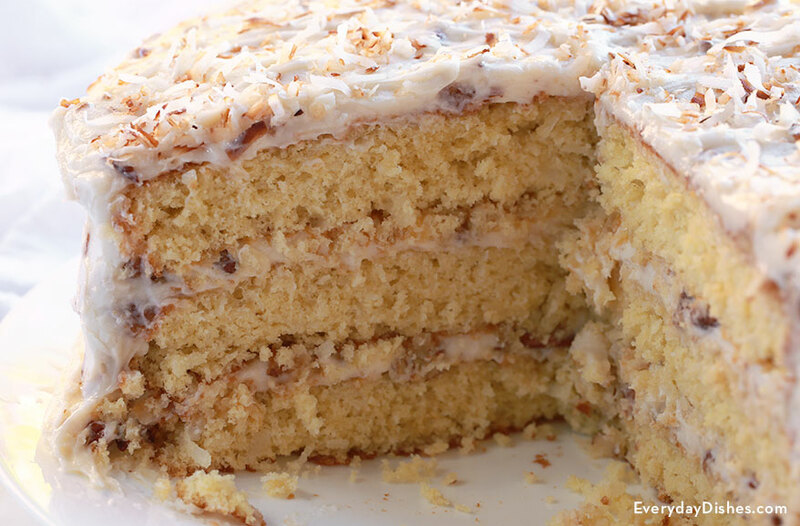 Our Italian cream cake not only looks fabulous—it tastes sinfully good, too! Wondering why some recipes call for separating eggs? Whipping and folding the egg whites in the cake will give you a lighter, fluffier cake. While these cakes are cooling, make a mouthwatering icing with butter, cream cheese, pure vanilla extract, powdered sugar and chopped walnuts. Frost cakes with icing, stack three layers high, garnishing with pecans, then serve. Guests are sure to savor every bite! Place the rack in the center of the oven then preheat to 350 degrees. Line the bottom of three 8" or 9" round cake pans with parchment paper then spray each pan with a non-stick cooking spray. In a large mixing bowl, cream 2 cups of sugar, 2 sticks of butter and ½ cup vegetable shortening until the ingredients are light and fluffy. Beat in the egg yolks, 1 at a time, until they’re incorporated. Next, mix in buttermilk, coconut and 1 tsp vanilla until all the ingredients are combined..
Sift flour and baking soda into the batter then fold the mixture until ingredients are well combined. Clean the mixing bowl well and add the egg whites and cream of tartar. Whip whites to stiff peaks then fold whites into the batter. Divide the batter equally into three 8" or 9" round cake pans. A kitchen scale is the easiest way to divide the batter among the pans, but if you don’t have one, just eyeball it! You’ll want to make sure the measurements are somewhat accurate—otherwise the cook times for each pan will vary. Bake the cakes for 25−30 minutes, until a cake tester comes out clean and the sides begin to pull away from the pan. Remove the cakes from the oven then place on a cooling rack, allowing them to cool in the pan for 10 minutes. After 10 minutes, remove the cakes from the pans and continue to cool while you prepare the icing. To make the icing, beat cream cheese and 1 1/2 sticks of butter in a mixing bowl until the ingredients are completely smooth. Sift in the powdered sugar then beat until the mixture is light and fluffy—then stir in 1 tsp vanilla and pecans. When the icing is complete and your cake layers have cooled, remove the parchment paper from the bottom of each cake. Stack the cakes—spreading about ½ cup of icing between each layer—then coat the exterior completely with remaining icing. Allow the cake to rest for about 1 hour then slice, serve and enjoy! Enjoy the simplicity of an elegant dessert that’s so easy to make!